In 2016, National Payments Corporation of India (NPCI) introduced a very smart way to make online payments: United Payments Interface (UPI). This is a new payment method that enables customers to link to one or more bank accounts to a mobile app and transfer money without providing any of their bank details. 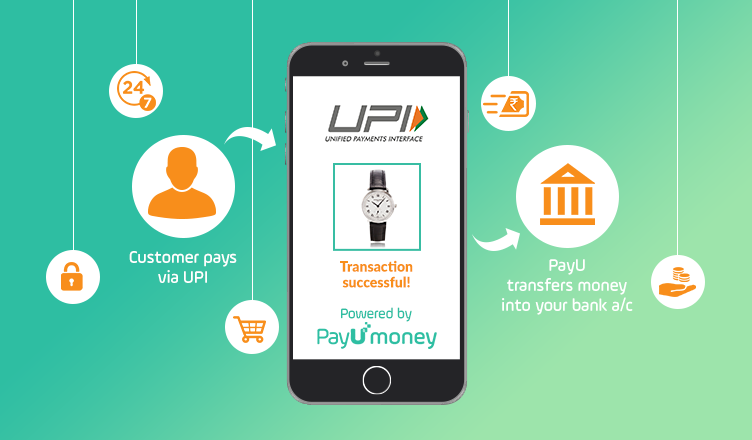 If you want to give the best payment experience to your customers then it’s time you integrate with a UPI payment gateway like PayUmoney, which is robust, trusted and secure to use. With UPI becoming a popular mode of payment, it makes sense for businesses to offer UPI as a payment option to their customers. You should go for a UPI payment gateway i.e. a payment gateway that supports UPI as a payment option along with credit card, debit card, net banking, wallets etc. Here, are lists of top benefits UPI offers you and also how your customers benefit by paying you via UPI. Since we are talking about UPI payment gateway, let’s include one of the leading payment gateways of India, PayUmoney, as an example. No App Needed: To accept payments from your customers in your bank account, there is no need to download, sign up or create an account in any app. Only your customers need the UPI app to pay you. All you need is a payment gateway which enables accepting UPI payments. No-integration hassles: A UPI-enabled payment gateway will automatically provide UPI as a payment option to your customers. Which means you do not have to put any additional efforts. Better conversions: When your customers choose UPI as their preferred payment method on your website, they will experience minimum redirects. Thus, helping you get maximum sales. High Success Rate: Since your customer’s Virtual Payment Address (VPA) gets auto-generated on the checkout page, for instance on PayUmoney’s checkout page, after making a purchase, they just need to enter their Mobile Banking PIN (MPIN). This 1-step, hassle-free transaction promotes higher success rate. Easy & Safe Payments: All that is required is just the MPIN to process payments! No OTP, password or sharing bank details from your customer’s end is required. Hence, easy and secure payments are possible on a UPI enabled payment gateway. Unlimited Transactions: UPI payment is the best option for your customers if they want to make a large number of transactions. Also, the upper limit for UPI transaction is one lakh per day. One App For All Banks: If your customer has multiple bank accounts, they can still continue to transact by saving their details, in just one app. 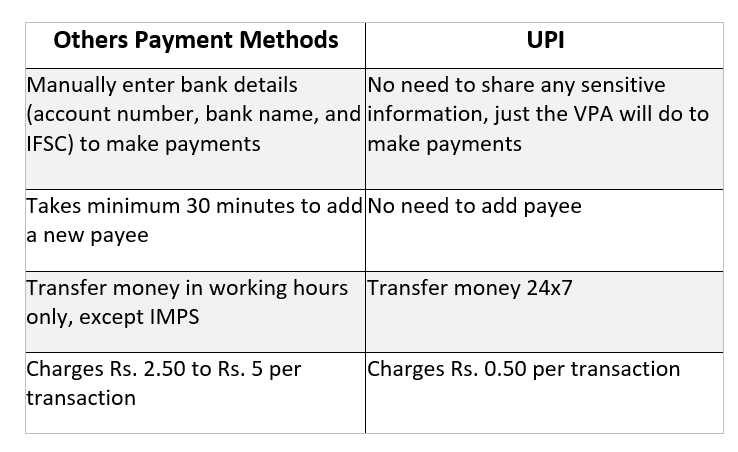 Before you go ahead for a payment gateway for accepting UPI payments, the technical details of sending and receiving UPI payments, let’s first understand the difference between UPI and other payment options. How Is UPI Different From Other Payment Options? You may argue that what’s the point of introducing UPI payment when IMPS or other payment methods are already well established. So, here is what makes UPI different from the rest? UPI, a highly secure method to transfer money instantly, is set to take the world by storm with its sophisticated public payment infrastructure. We wish the best for your business and now it’s your turn to give to your customers. SignUp on PayUmoney – A UPI Payment Gateway and accept UPI payments from customers easily to grow your business effortlessly.